We are all pretty familiar with the causes of the 2008 recession. In a word, it was greed, as evidenced by America’s bankers and brokers. What we saw from Wall Street was a willingness to do what they knew was wrong in order to enrich themselves. How well have we recovered from that? Have the Americans who were most severely impacted by the recession been made whole? Has unemployment improved? Have wages kept pace with cost of living? Corporate earnings have shown some modest growth and the stock market has appeared to be reasonably healthy. 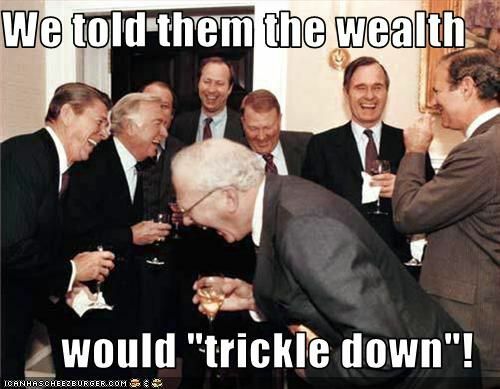 Has it trickled down? At best an occasional slow drip. There is an air of stagnation about the economy for most Americans and it is because of a level of greed that may be a little less obvious than that demonstrated by the pirates of Wall Street in 2008. But the theme is the same, make as much as you can as fast as you can and don’t worry about what that means for the future. So analysts who follow companies focus primarily on profitability and evaluate public companies through that lens. Those companies in turn focus on short-term profit. Growing a company requires innovation, development, building customer loyalty and a strong reputation. None of those things happen in a matter of weeks. So if you want to improve your bottom line now, what do you do? You can raise prices and you can cut costs. Neither is going to make your business any better and may in fact hurt you in the future but if it’s short term profitability you are after it works. I recently saw some news about the retailer Macy’s that demonstrates this approach. Macy’s reported 2013 sales growth and improved profitability and as they announced that they also announced they were laying off 2,500 employees. Screw you Macy’s employees. Screw you Macy’s customers, who can now expect an even lower quality of service than has been the norm at these stores. The stock price? It has risen smartly. But the greed is not confined to investment bankers. Take a look as well at the C-Suite of many medium and large corporations. We would like to think of the average CEO as someone who is committed to and passionate about the business he or she manages. Someone who is concerned about the long term health of the business, its customers and its employees. But in all too many instances that is not the case. It is no longer fashionable among the executive set to grow with the business that they manage and commit to its success on a long-term basis. Instead what we often have is the totally self-absorbed CEO interested not in growing the business but in growing his or her own personal brand. Their goal is to appear to achieve enough success to enable them to move on to bigger and better things.  — Decisions are made only on a short-term basis because the executive doesn’t expect to be around long-term. So this month’s results are far more important and thus if there are decisions to be made which would benefit a business long-term but which require an investment that reduces short terms results, those investments are never made.  — Quality is neither a concern nor necessarily even a goal. It is in fact the goal of these individuals to produce what is “just good enough” to sell because their appearance of success depends on running a profitable business and every effort to cut corners is made to achieve that immediate profitability even if it may mean loss of customer satisfaction or loyalty.  — The same lack of concern for quality impacts the status of companies as employers. Again the goal is to get just the minimum that is necessary with the smallest amount of spend. That is why so many employees of large corporations don’t make a salary on which they can support themselves or their families no matter how hard they work.  — Employee development is of little concern because the “what’s best for me now” philosophy has no room for building a future. The CEO doesn’t expect to stay more than 2-3 years and any employee who does is considered a loser. Far easier to hire from outside than to train and mentor over a period of time. This erodes employee morale throughout an organization. So the overall impact on the economy is that we may see a growth in revenues, a growth in stock prices and at least the appearance of short-term success. But the overall economy does not benefit because, jobs are not created, wages are depressed and the overall productivity of the country suffers from a lack of quality. This in turn places a limit on these very same corporations because their customers don’t have the means to maintain or expand their spending. I don’t really have any suggestions as to how to change the attitude of America’s corporate leaders. Their greed is usually accompanied by a sense of entitlement that insulates them from things like basic ethics. I do know that it is mostly in small business where you find managers who are committed to the long term survival and growth of their business because their business is their livelihood. Thus they care about the quality of what they produce or sell, they care about their customers and their reputation and they value the employees who help them achieve their goals. I personally try to make my buying decisions with that in mind. This entry was posted in Uncategorized and tagged economy, management, recession, Wall Street. Bookmark the permalink.